Species Research and Information provided by: Avian Contributor: Jeannine Miesle. Additional information provided by Avianweb. 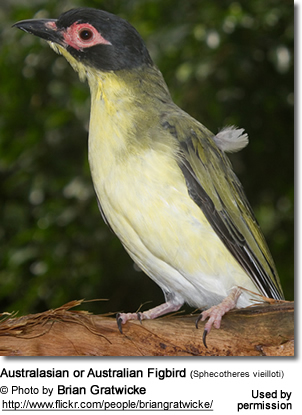 The Figbirds are a genus (Sphecotheres) in the orioles family and may be observed in the wooded habitats of Northern and Eastern Australia, Papua New Guinea and the Lesser Sundas, and the Kai Islands in Indonesia, as well as on the islands of Timor and Roti. Previously thought to be conspecific (of the same species), with the Orioles, the figbirds are now considered to be a separate species by ornithologists. Authorities’ opinions differed mainly on the sizes and measurements of the species, as well as on their plumage and on biogeography (the study of the geographic distribution of plants and animals). Australasian Figbird / Green or Southern Figbird (Sphecotheres vieilloti - Vigors & Horsfield, 1827) – Found in Northern and Eastern Australia, Southern Papua New Guinea, and the Kai Islands in Indonesia. Figbirds are generally found in the coastal regions of Northern and Eastern Australia and from the Kimberley region in Western Australia around to the New South Wales/Victoria border. They live in rainforests, eucalyptus forests, woodlands and wet sclerophyll forests. (These are forests of woody plants which live in dry areas. They have thick, leathery evergreen foliage that retains water.) The Figbird can frequently be seen in urban parks and gardens, especially if those areas contain fig trees and other fruit-producing trees. They will inhabit orchards, watercourses, parks and gardens which include leafy trees and berry-producing plants. Often they are observed in mangroves—tropical evergreen trees on tidal coasts. While Figbirds generally remain in their own habitats, they will travel to areas that provide food sources. The medium-sized Australasian Figbird has a total length of 27-29.5 cm (10½-11½ inches). The other figbird species are generally smaller in size. 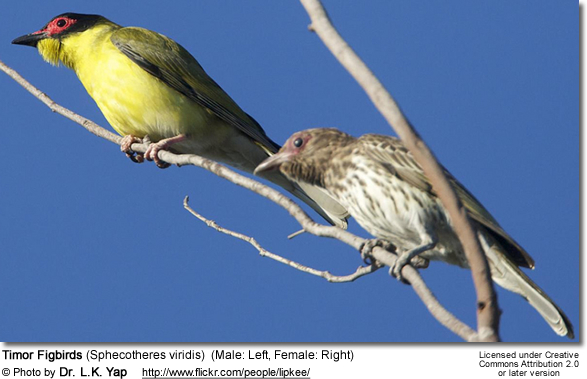 The Figbird is usually observed in its range and in protected areas. They are highly sexually dimorphic (males and females can easily be visually identified). Males have bare, bright red facial skin around the eye, which contrasts against a black crown and grey neck and throat. The rest of the body is olive-green, except for an area under the tail which is white. Females are not as colorful; their bodies are brown and white with strong dark streaking. Their facial skin is grey, displaying no other distinctive head markings. Like the males, the tops of their bodies (dorsal areas) are brown-green above and their underparts (ventral areas) are an off-white with brown streaking. Both sexes have a greyish-black bill with a red base and pinkish legs. Juveniles resemble females, but the streaking below is generally not as strong. Figbirds typically breed in small, loose colonies, constructing their nests in close proximity of each other in nearby trees. The Figbird fashions a most unusual nest. The flimsy cup nest is shaped like a hammock and suspended from a horizontal fork in a tree near the end of a branch, between 6 and 20 meters from the ground. The nest is composed of vines and twigs. The Figbird will breed from September to February, and it will lay 2-3 pale-green eggs with brown blotches, which are incubated for about 18 days to hatching. Both parents share the incubation duties and care for the young. The Figbird is an aggressive species, able to drive away nearly all predators, thereby affording protection to its nest sites. The young leave the nest when they are about 16 - 17 days old. During the non-breeding months, they travel in flocks, foraging for food in the trees. The flocks are large, containing as many as 40 birds. 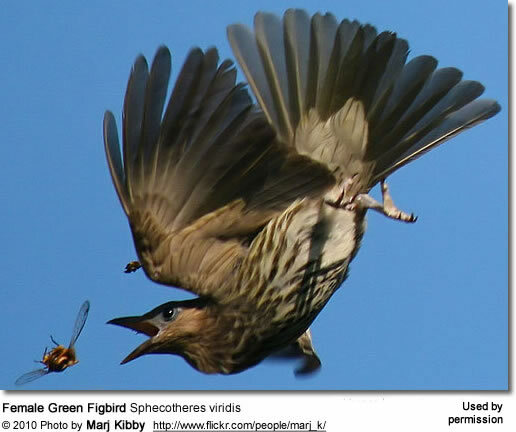 Figbirds feed in flocks of around 20 birds. Figs are a particularly popular food item (as suggested by their common name), although they will feed on most soft fruits (including bananas and pawpaws), and native berries in canopy trees. They consume Insects also. They also have been known to eat nectar and seeds. An outgoing group, their call resembles a loud, descending 'chiew.' Australasian Figbirds have in their repertoire of sounds many different short calls and are also able to imitate the calls of other birds. They will mimic parrots and some species of orioles. Their vocalizations are mainly a series of simple whistles and noisy chattering.